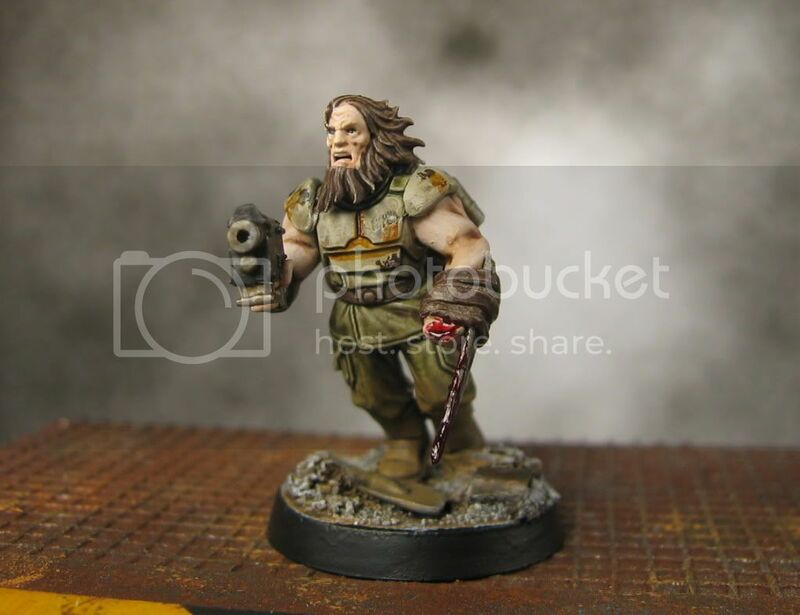 Here are some quick pictures of a Renegade Sergeant conversion I have been working on. 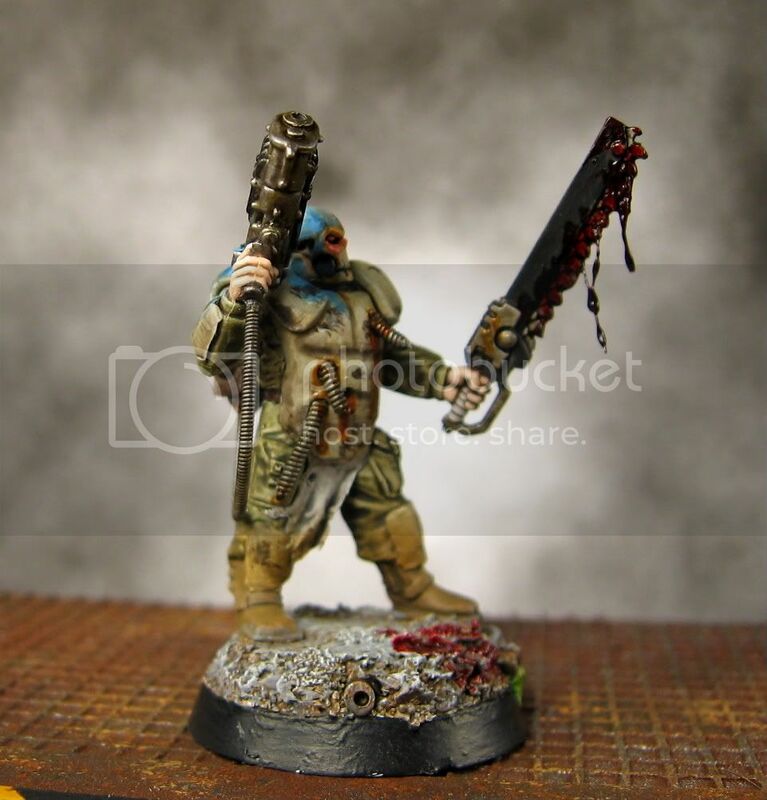 The base model is the new plastic Warriors of Chaos Warhammer Nurgle Lord. 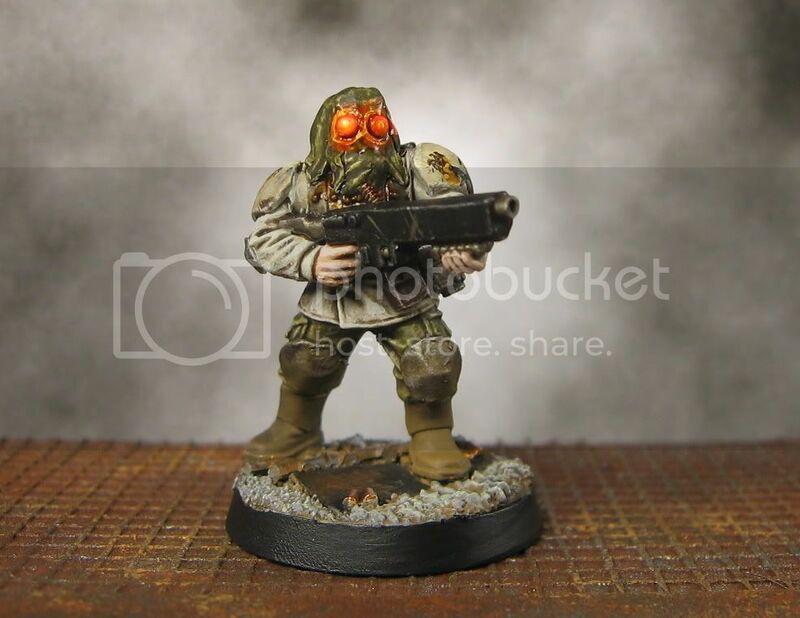 I am tempted to get a few copies of this model and convert one for each of my armies. Lets see how this one goes first. I am really loving the new plastic heroes released this year. 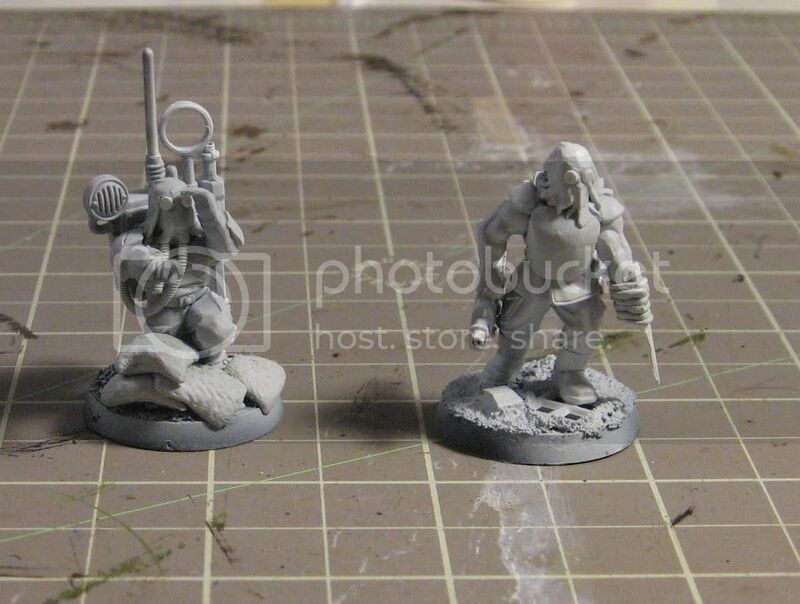 I have 4 or 5 more plastic heroes in my bits box just waiting for some conversion fun. This conversion is not quite complete. I still need to sculpt the left arm but need to let the greenstuff set first. 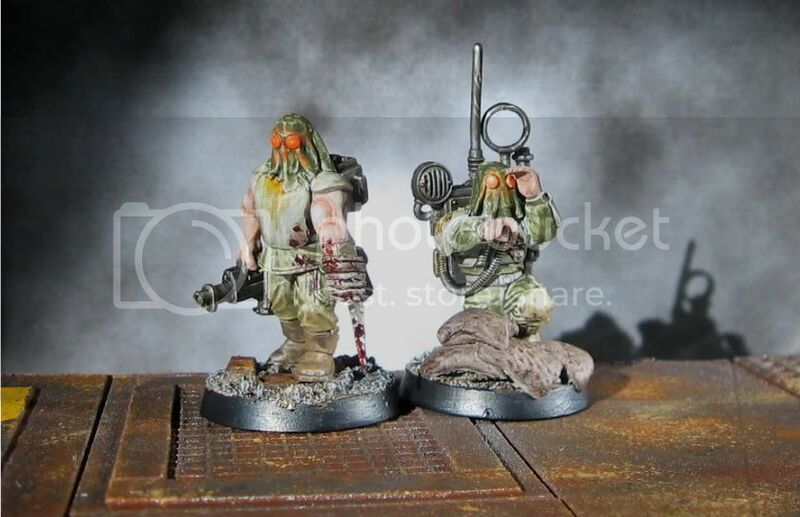 As soon as I saw this model released I knew it would be perfect to represent a Renegade Sergeant with the "Unnatural enhancement" mutation in Deathsquads (basically, he is just huge and gets +1S, +1T, +1W). The cables are Dragon Forge cables (which are excellent). 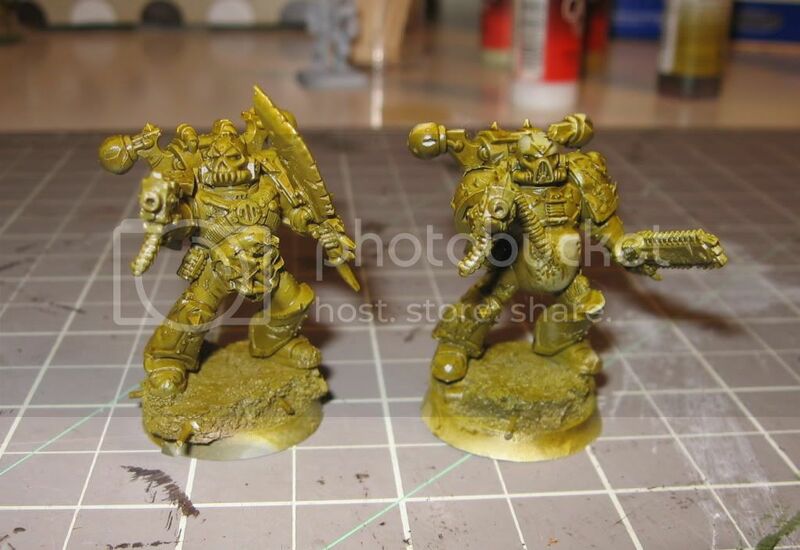 The arms are chaos space marine arms. It was really fun sculpting the stomach and arms and mask. I tried a few little techniques that I will try to show in the final pictures. I added more holes and rips to the mask and wear to the armour to help it to match the rest of the model. Welcome to new followers cadaver, zanazaz, rogue pom, and oink. Hopefully I will get some paint on this model soon. I have 6 other models primed and that I have begun to paint. Once those are done I will get some paint on this guy and the servitor. Back to painting. 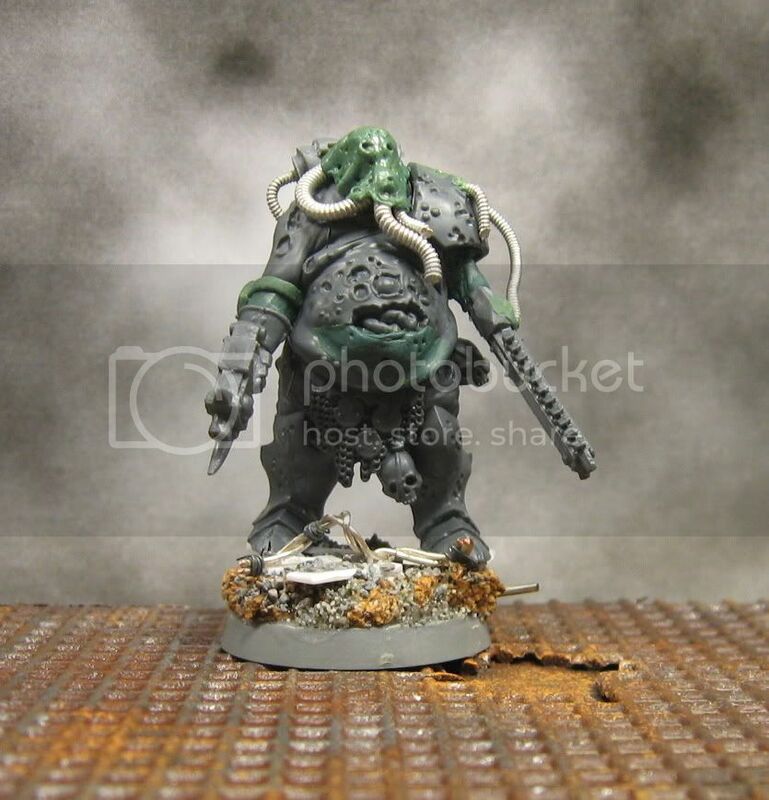 Update: I have added pictures of the painted model to the bottom of this post. I've also added a few examples that Komfritten from the deathsquads forums built as well. 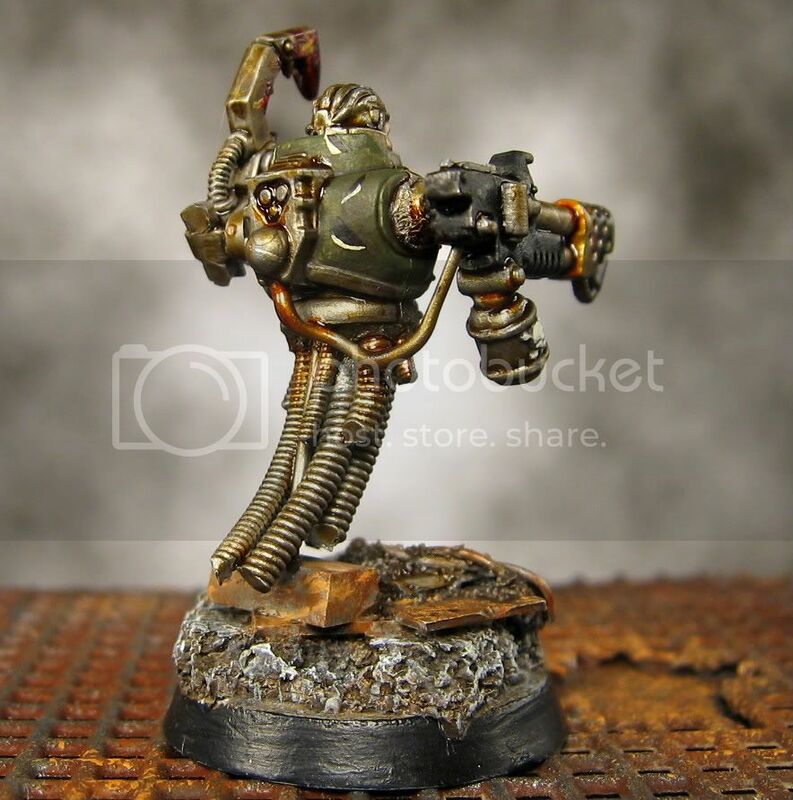 I hope this post inspires some of you to build your own servitors! 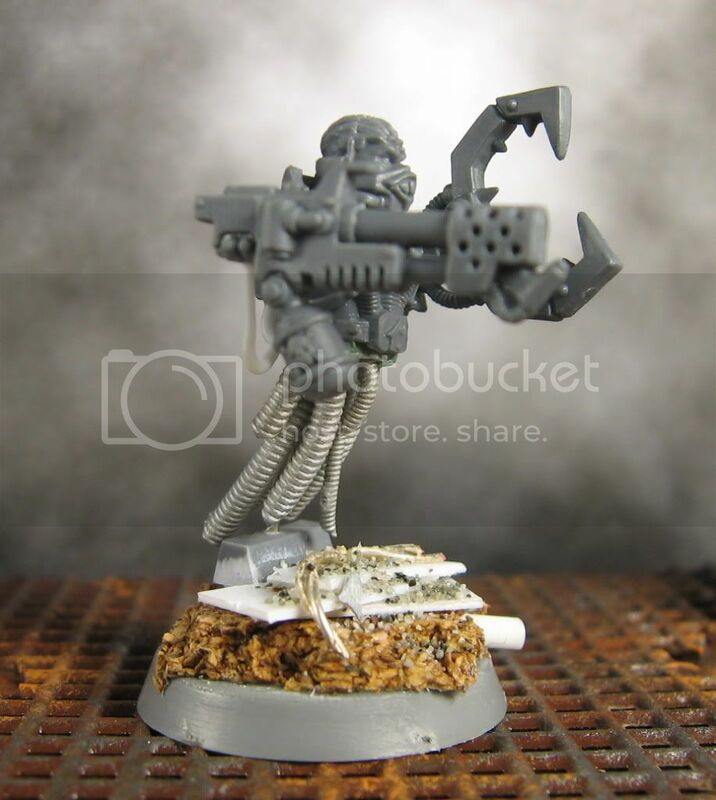 I spent a few minutes today putting together this exciting gun servitor for my imperial renegade squad. I found a great tutorial last night here and had to make one for my chaos militia. 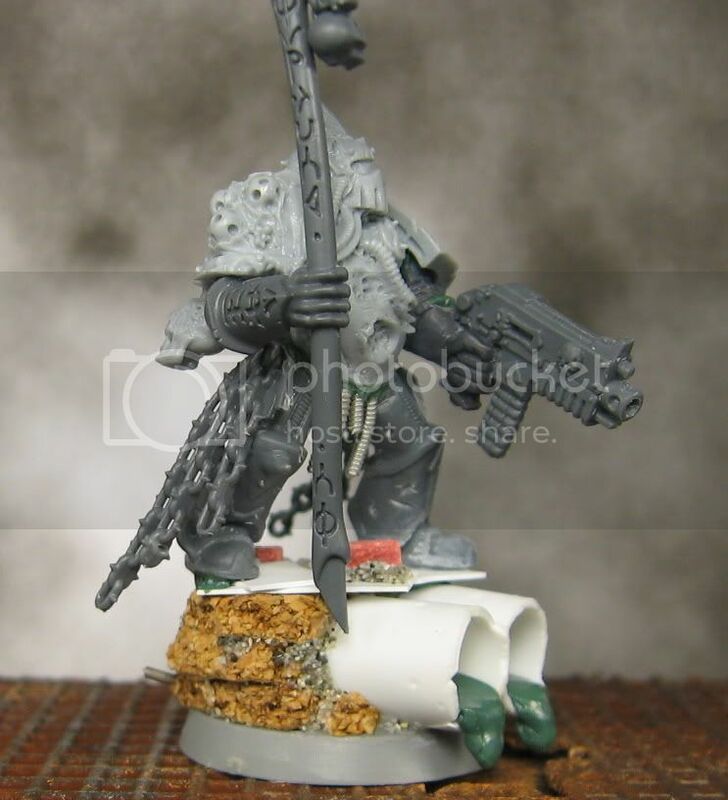 The torso is a chaos space marine. The cables are Dragon Forge cables of various sizes. 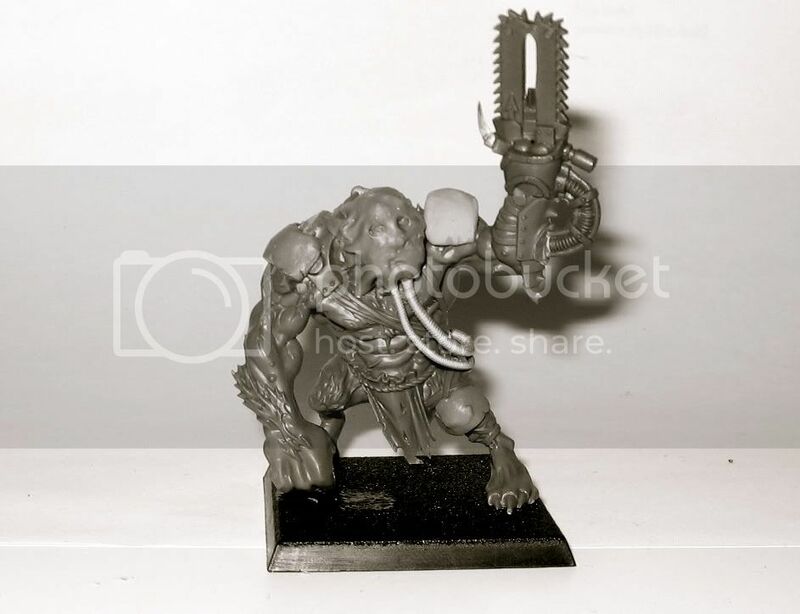 The claw is from the Ork runtherder. I first glued the torso together and glued on a suitable head. 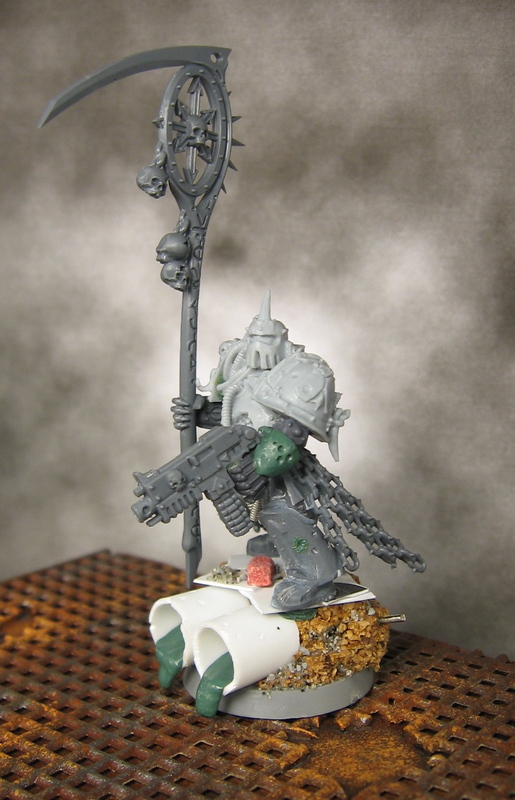 I didn't add the CSM backpack as I didn't want the full marine silhouette. I drilled a hole in the base and in the torso and pinned it using a paper clip. 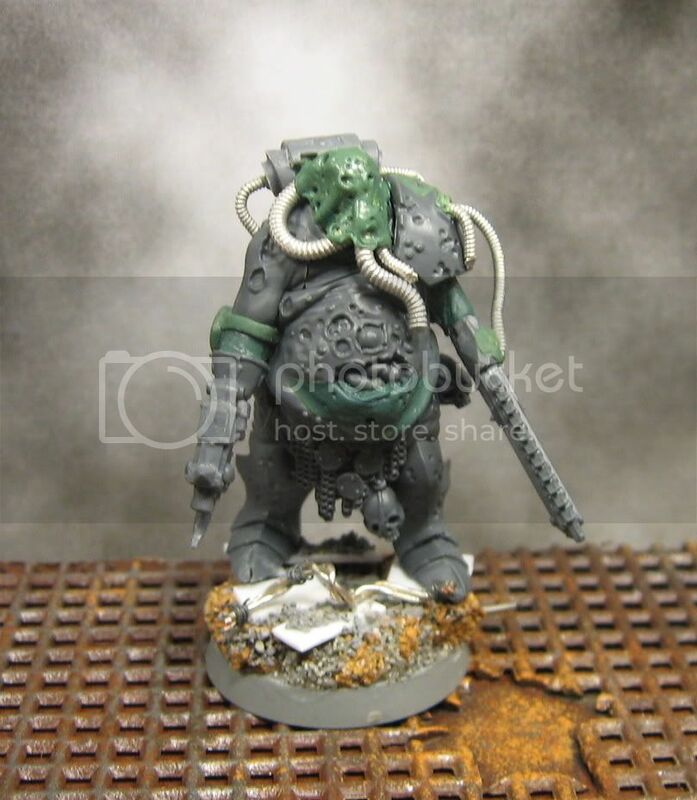 I then added a blob of greenstuff under the torso and stuck in cables of various sizes. I bent the cables back a little to add the appearance of motion. I decided on a claw and a flamer for the weapon arms. I cut a small piece of plasticard tube and attached it with super glue and greenstuff to each arm socket. I then drilled a little hole at the base of the backpack attachment and at the handle of the gun and made a little cable from really thin plasticard tubing (it was a pain, try to find something more bending if you try this yourself. 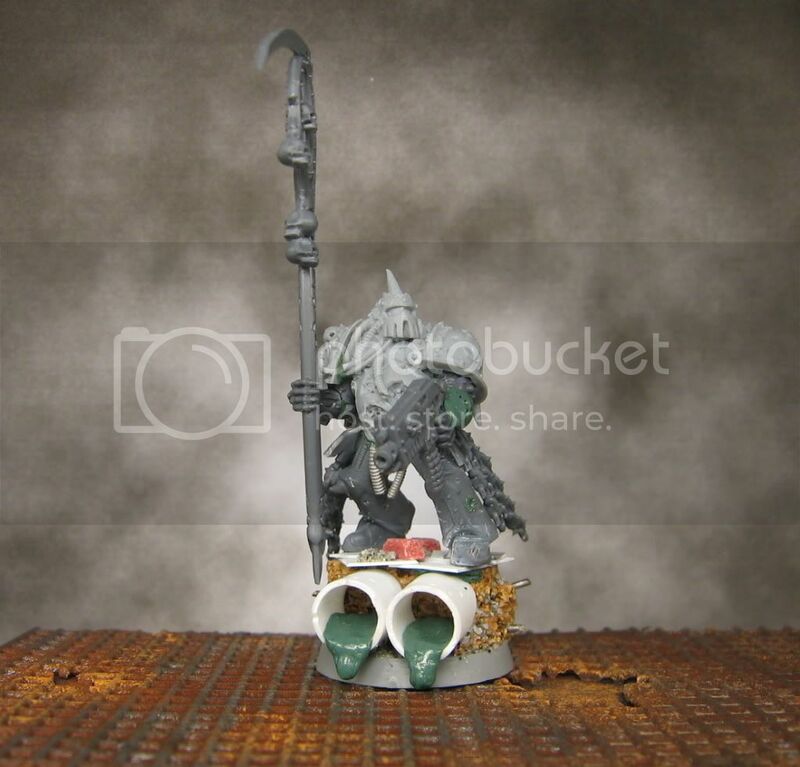 I built the base by using a bit of cork, then some plasticard bits, some wire, a little tube, and a bit of sprue. 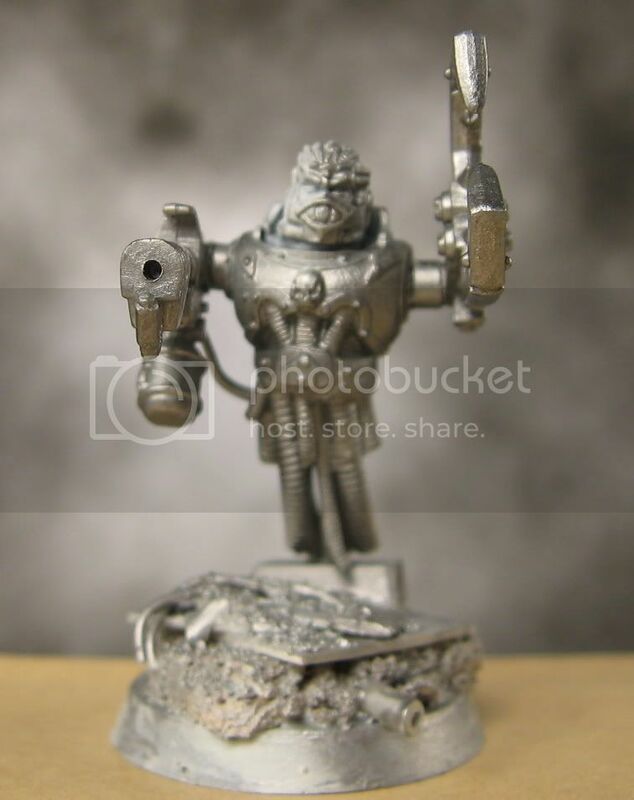 I used the sprue to attach the paperclip to the torso as it provided a solid attachment point. In total, I probably spent under an hour on this conversion. 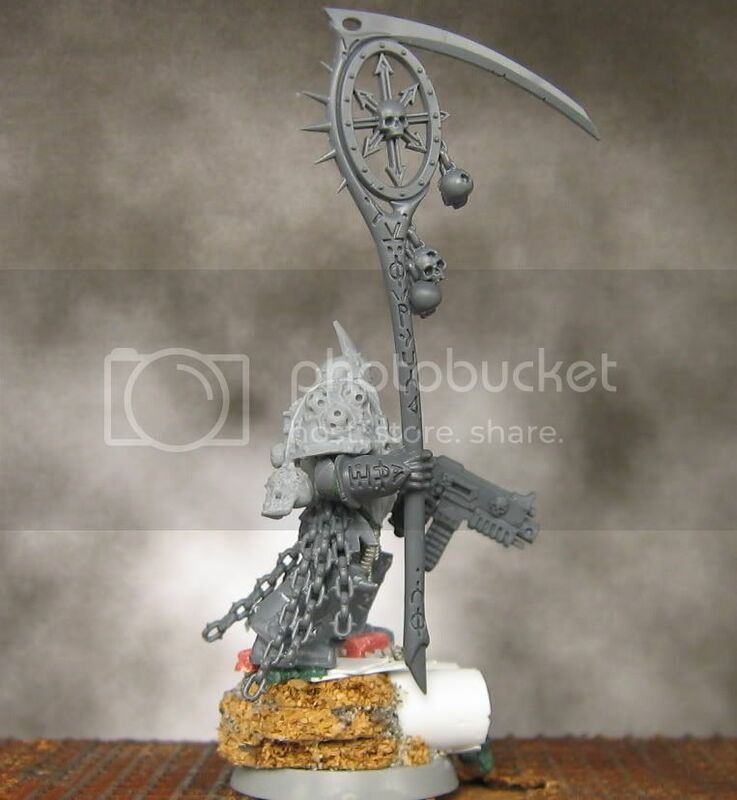 You could use any bits you have around and make an interesting and unique model. 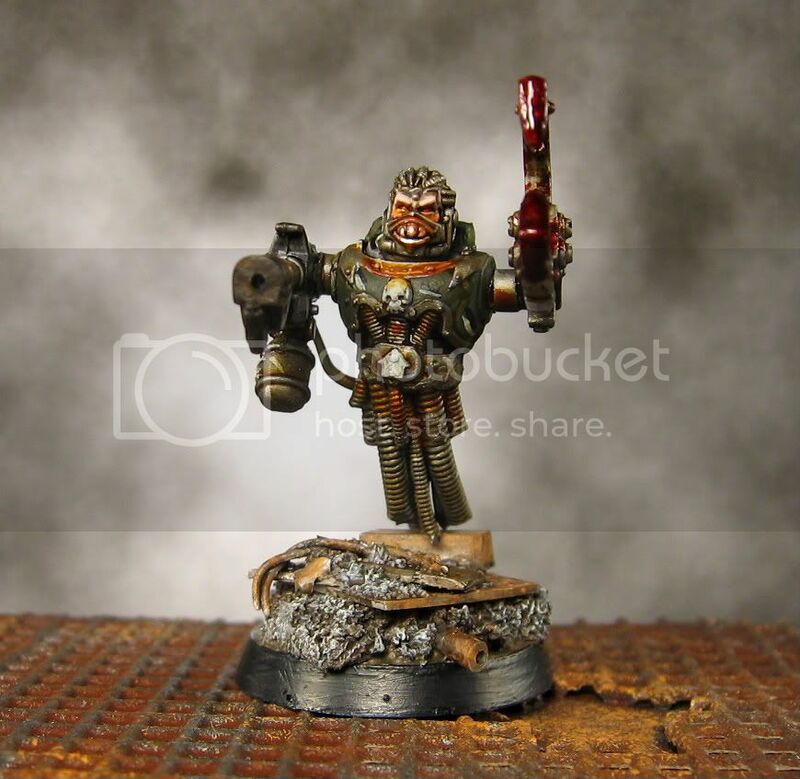 Here is my finished servitor. 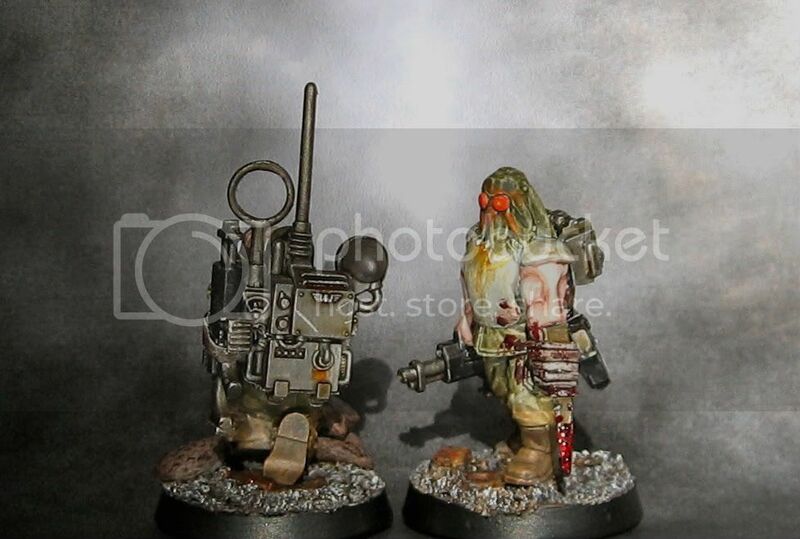 Here are two servitors built and painted by Komfritten from the Deathsquads game forum. 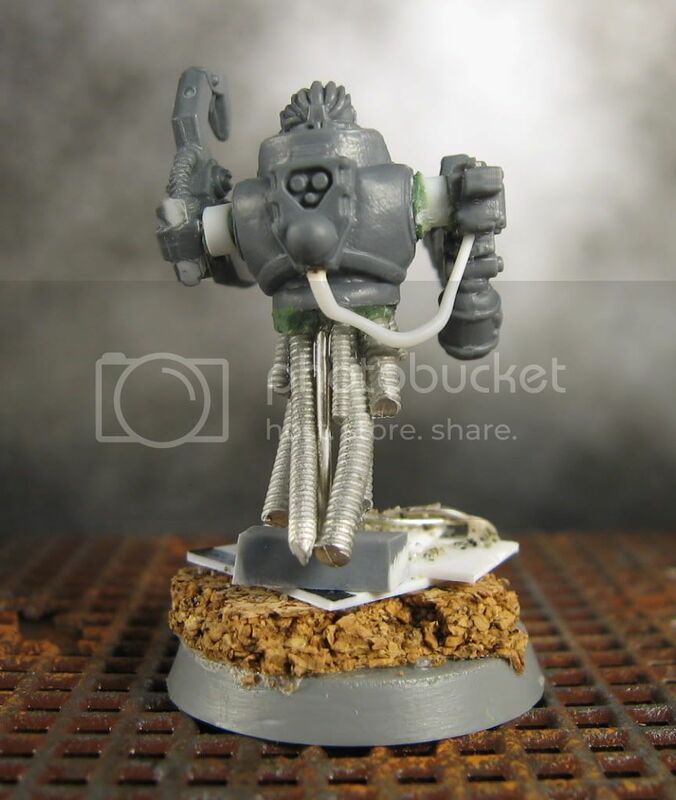 You can see that Komfritten has used a CSM head, terminator arm, space marine backpack and torso and some other bits and wire to build this model. I especially like the wires. 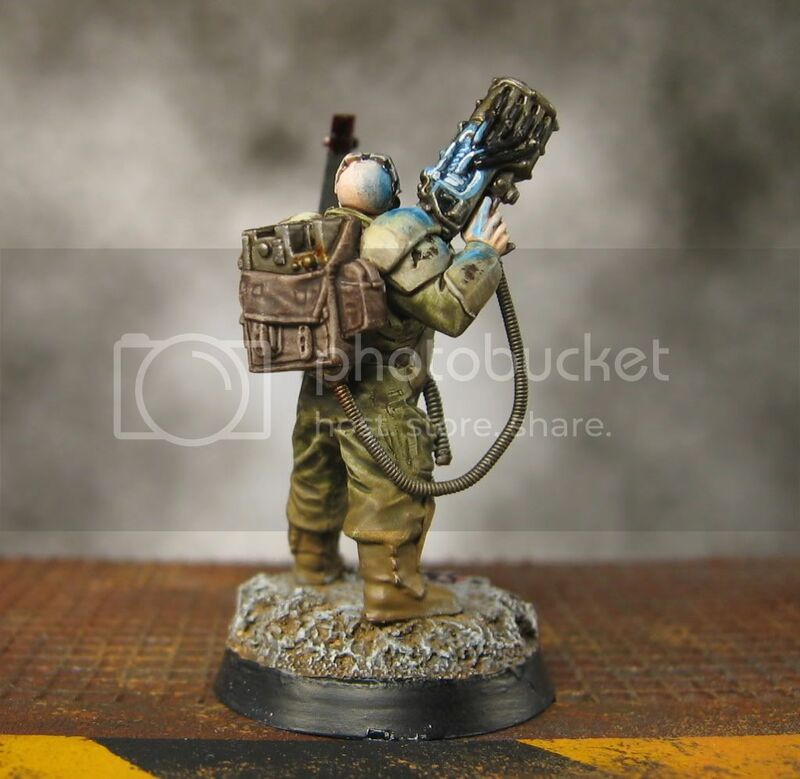 And another servitor from Komfritten. 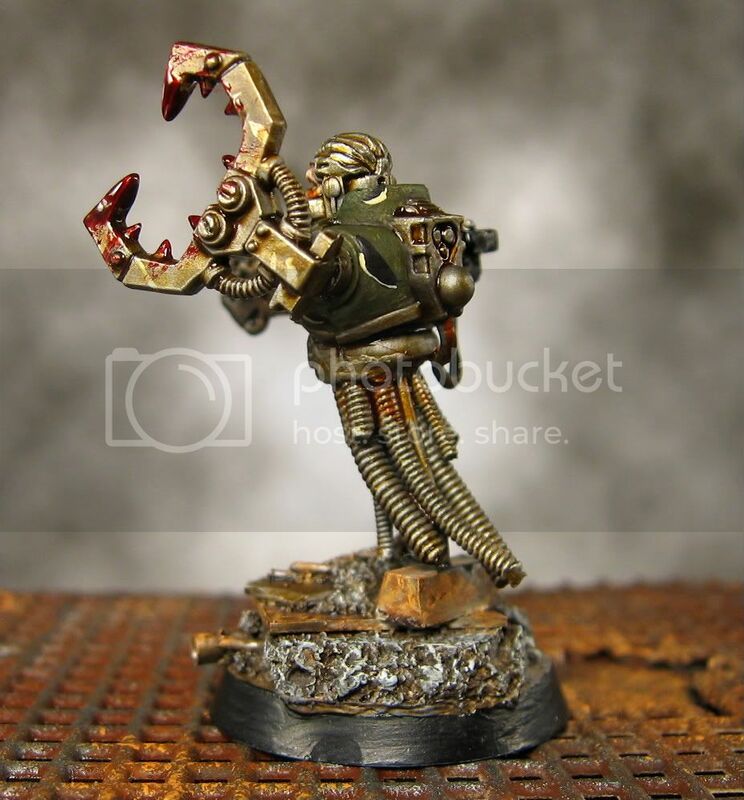 This model by Komfritten in even more creative. 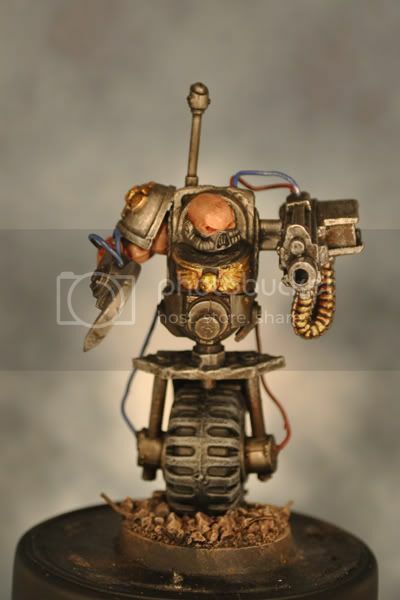 He has an awesome hook weapon, a heavy bolter, and a space marine bike wheel to run around on. 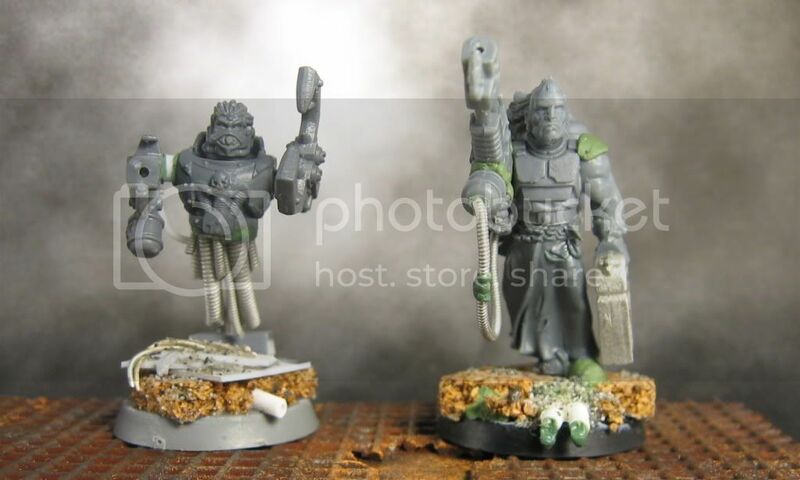 The great thing about these conversions is you can use bits from just about anywhere. Wow. That's a lot of custom automaton goodness added now. I hope you enjoyed these pictures. 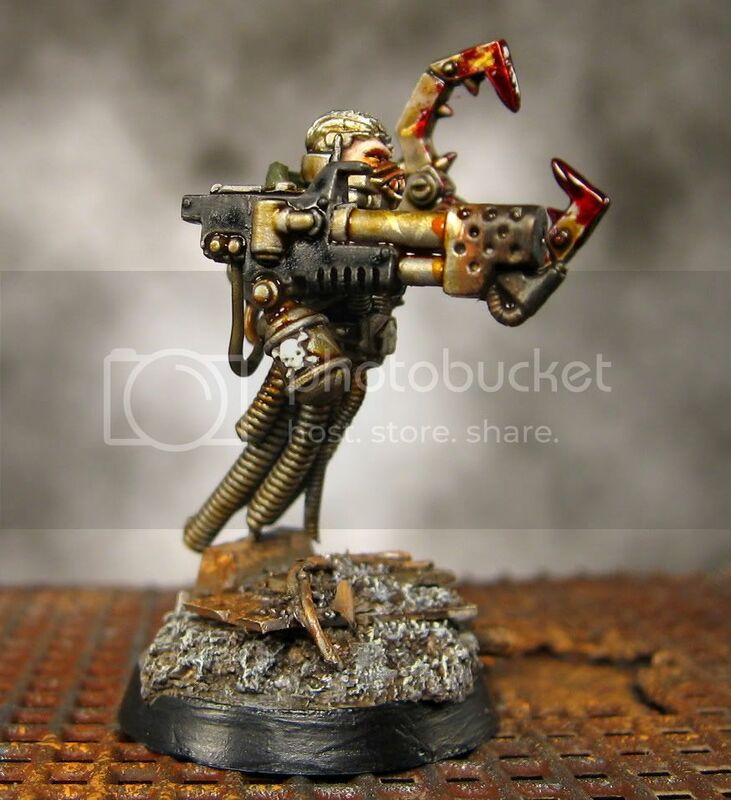 If anyone has been inspired to build some servitors and would like them featured here just post a link to some pictures in the comments section and I will be more than happy to add them in. I've always really wanted to make some big water features to add to my gaming tables. I think they add a lot of complexity and strategic choices. I had originally planned to build them into my boards but I got impatient and decided to build some modular ones. Modular river sections are also great as rivers can really affect gameplay. With a modular set like this you can change the river system and remove it for some games. I chose to use 1/4" hardboard as I thought it would be less likely to warp than thinner 1/8" hardboard. The moulding is the stuff used as baseboards in houses or between the walls and ceiling. I chose the 11/16" rounded ones as I thought they would be stronger than some of the thinner ones and would look alright painted up. Use whatever shape and size of these that pleases you most. You can find them at any hardware or home improvement store. Total cost for the materials used was about $20. I had access to power tools, which sped up this project considerably. All of this could be done with a handsaw and a mitre box as well. Important note: If you are under 18 or unfamiliar with power tools, please get someone to help guide you. Table saws are dangerous. I was visiting my parents' house a few weeks ago and decided to really get this project started as I had access to their power tools. I started by laying out the approximate pieces I wanted. I decided to make the canal 4.25" wide, including the sides and to do each length in 6" increments. I started by setting the table saw to 4.25" wide and carefully cut the hardboard into 4.25" wide strips. I then used the mitre saw to cut these strips into 12" and 6" lengths as needed. 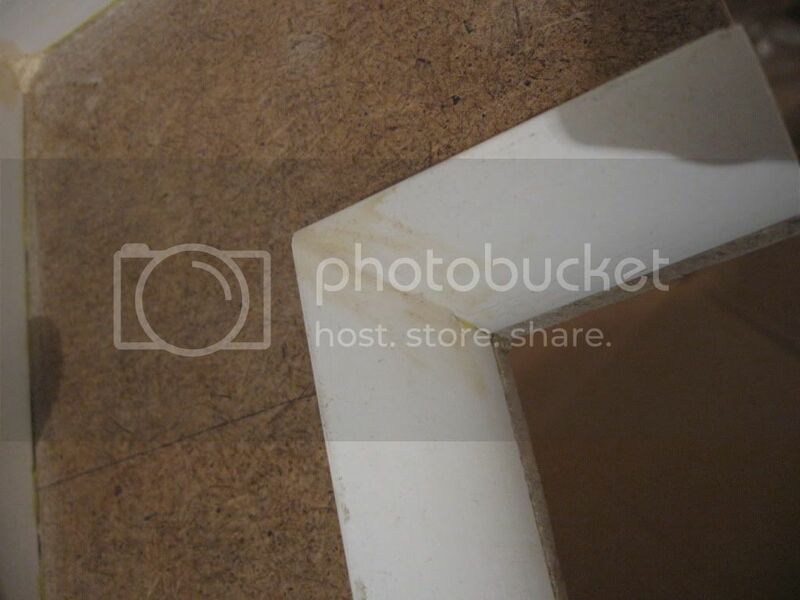 I also cut a 6" wide strip and used a handsaw to cut out the corners to create a corner that is 6" in each direction. I then used the mitre saw to cut the moulding to fit each piece. For long straight pieces I simply made a 90 degree cut to the correct length for each piece. I then set the mitre saw to cut 45 degree angles in both directions and carefully cut the moulding to create the 90 degree corners where needed for corners. I set it up so the rounded side of the moulding is always facing out. Be sure to carefully check each piece when cutting as it can be confusing with the rounded sides and the mitre cuts (I made lots of cuts in the wrong directions). Here you can see some of the different shapes I made. The filler shows where the 45 degree mitre joints are. Next I attached the pieces to their bases. I carefully applied a thin layer of glue using a scrap piece of wood. I put it carefully in place and let it set for about 10 minutes (while I worked on others). The moulding was not sitting perfectly on the wood so I decided to flip the pieces over and insert screws through the hardboard and into the moulding to secure them in place. I then used a small drill bit (the back of your screws will say the size to use) to drill pilot holes where I wanted to place screws. I generally put in one screw for each 6" in length. Be careful to place the screws 1 inch along the moulding to prevent it from splitting. I made this mistake on the first few. Drill the pilot holes about the depth of your screw. Then change drill bits and put in the screws. 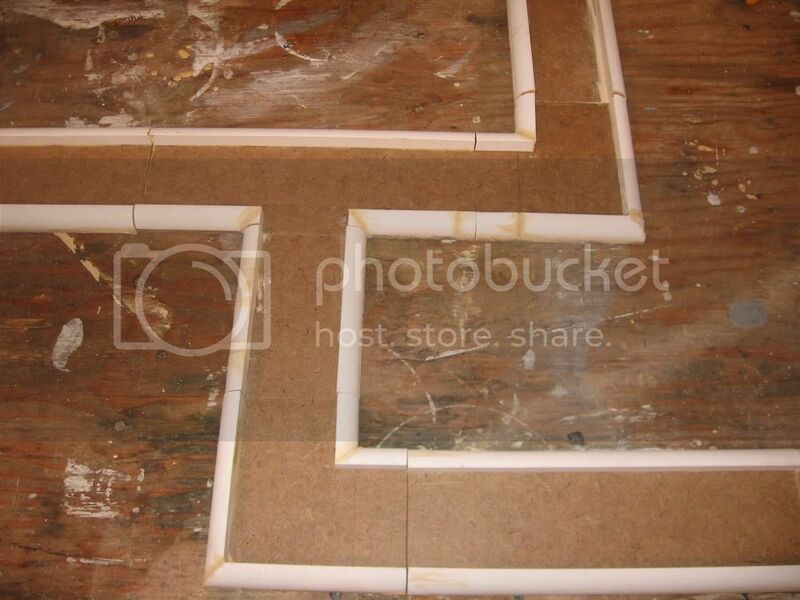 Try to get them as flush with the base of the mdf as possible. For some of the short pieces I did not bother with screws as it would have broken the small pieces. The screw at the top right is to close to the edge. The moulding split and the edge of the hardboard broke down a bit. The bottom right screw is much better. I used a sanding block to remove the excess hardboard around the screws. I left the glue to dry overnight. Once it was set I cleaned off some of the excess glue. 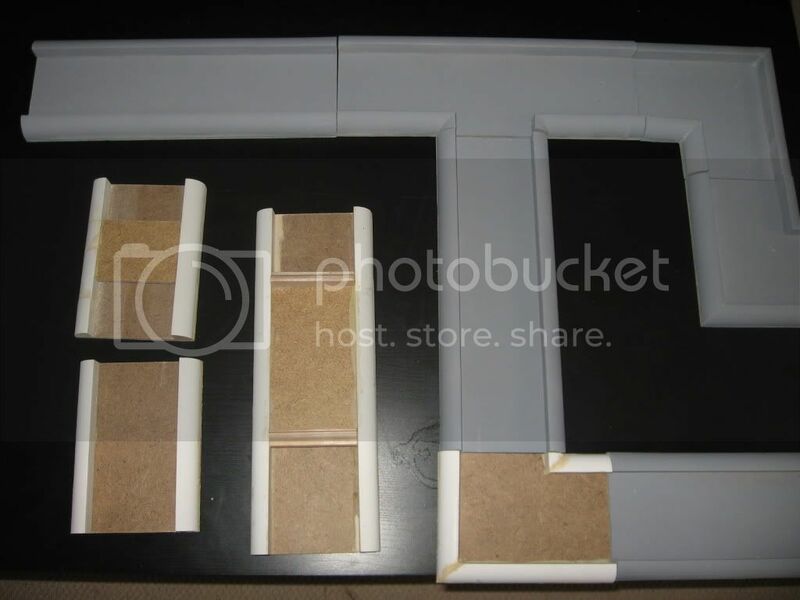 I used wood filler putty (sawdust and glue works equally well) and filled in all of the cracks where the moulding meets the mdf, where I split the moulding, where the mitred corners meet, and where I glued small pieces together when I ran out of moulding. 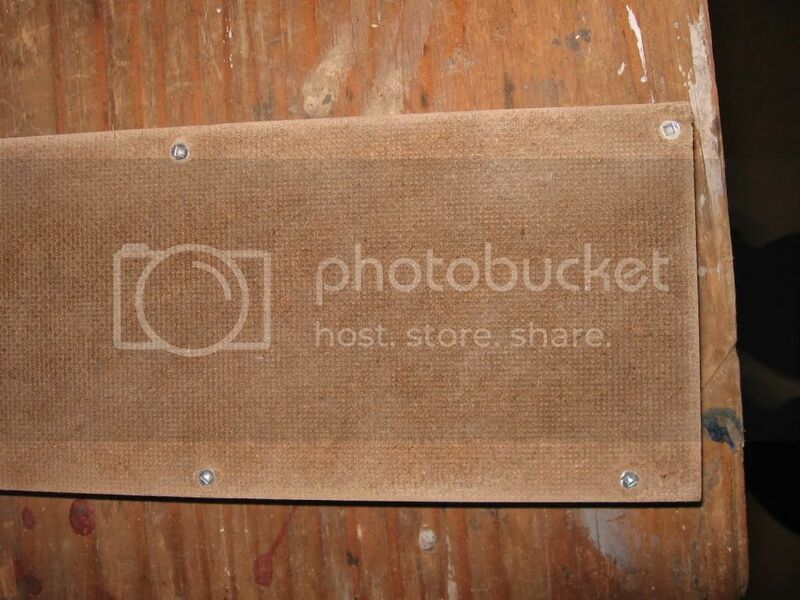 Let that set overnight and then sand it smooth using a sanding blog or various grits of sandpaper. You can see where I used wood filler to fix the messy mitre joint. I also cut a few pieces of hardboard to make small permanent bridges on a few pieces. This is optional but for skirmish games I thought some walkways would be nice. 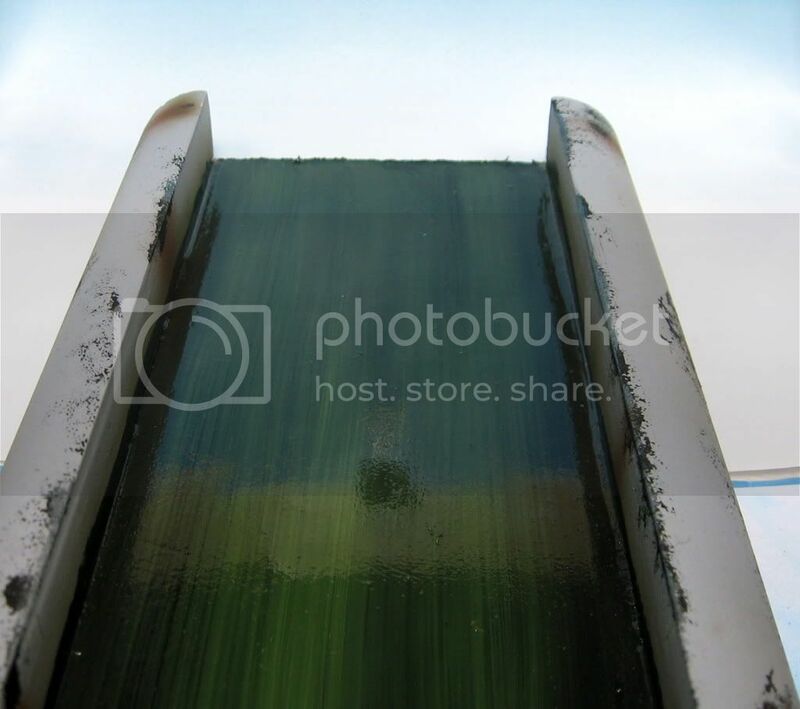 You can also add some junk on the bottom of what will be the canal before painting so you have some floating debris. Once this was complete I brushed off the dust and spray painted them outside using a matte grey primer. The set so far. You can see that the different pieces allow for a lot of different options. This is more than I will ever use at once on my 4' x 4' skirmish table. The painted sections can be seen here. After almost a year of being unable to decide/not having the skills to paint my imperial renegades I have finally finished four models. I tried lots of new (to me) techniques on these models. These are the first painted models intended for my Imperial Renegades squad for the skirmish game Deathsquads. 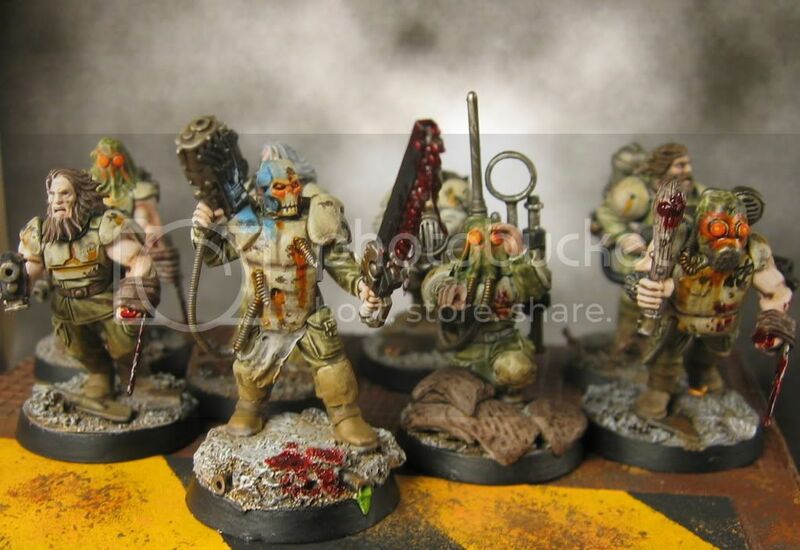 Some of the conversions for this squad can be seen in this post. A group shot. 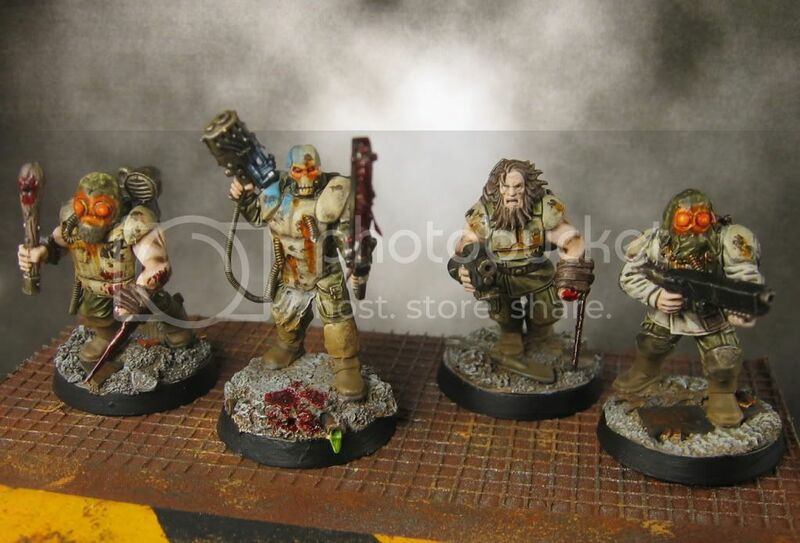 Vox caster, flamer, militia with autopistol and combat weapon and militia with autogun. The nasty blood on the spike was painted using a 1:1 mix of Tamiya Clear Red and Vallejo Charred Brown. I added two layers to really get a nice effect. The greasy metal color was achieved using a mix of thinned Tamiya Clear Orange and Badab Black wash. 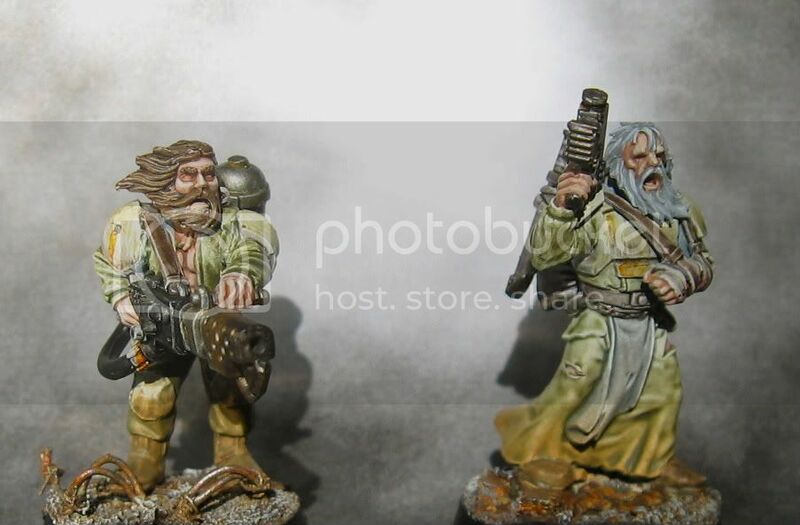 I added dirt to the robes by lightly spraying them with Vallejo Game Color Earth (after the clogs cleared out of my airbrush). 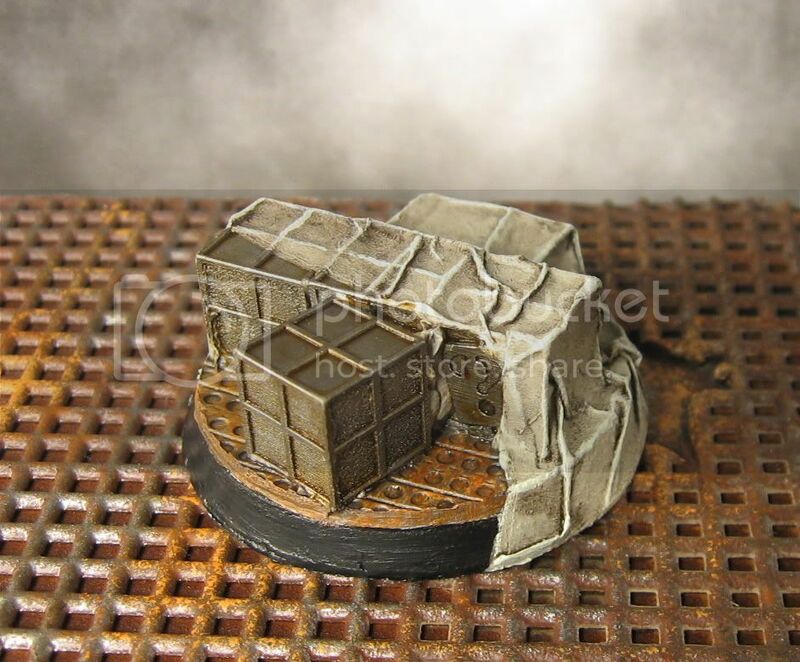 The bases were all built using scraps of cardboard, plastic, and wire and a mix of sand and medium ballast. All of the cloth and leather areas were painted by glazing different colors. I didn't do any highlighting on the cloth itself. I also tried a new technique for painting skin. I painted a thin base of Tallarn Flesh and then washed and highlighted it up by mixing in more of a light cream color. I think the blending looks better this way. All of the tones fit together fairly well. 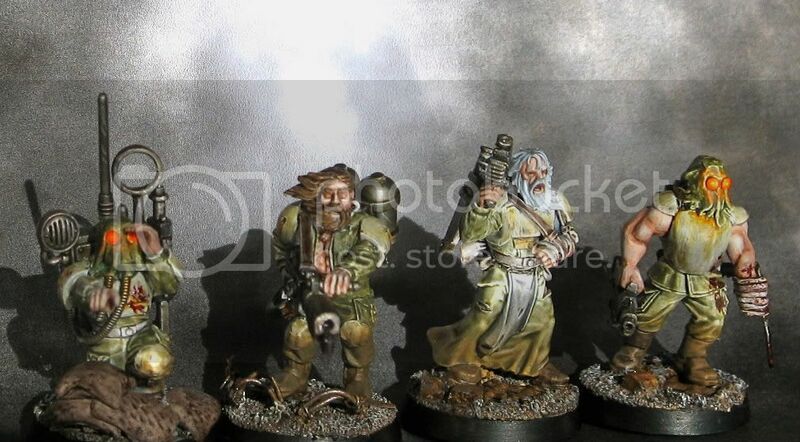 The colour scheme was inspired by Mika's work on warseer and photobucket. I am pleased with how these models turned out. Now I just need to paint another 14 of them and this squad should be (mostly) complete. 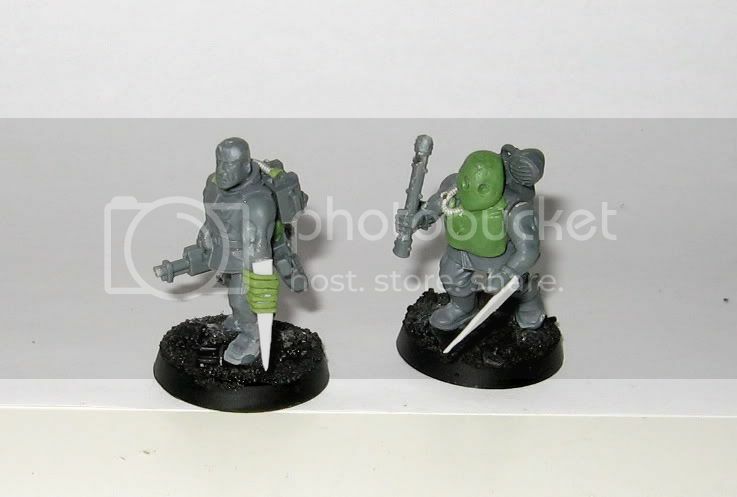 I like how the hoods look, so I might get some more cadians and convert a few more when I get the chance. Finally, welcome to new members dylangould, blitzspear, ricalope (I'm a fan, I heard of your site from chaoticorder when I was in Victoria), Dai Dead, Warsflake, and Spankyhojek. 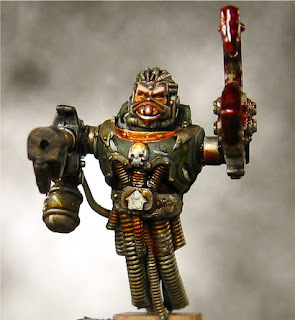 Thanks also to the Santa Cruz Warhammer Honour Roll for listing my conversions! Thanks for your support everyone. This blog is up over 2,000 views now in the first month and a half. Comments, criticisms, tips, and suggestions are greatly appreciated. Thanks again! 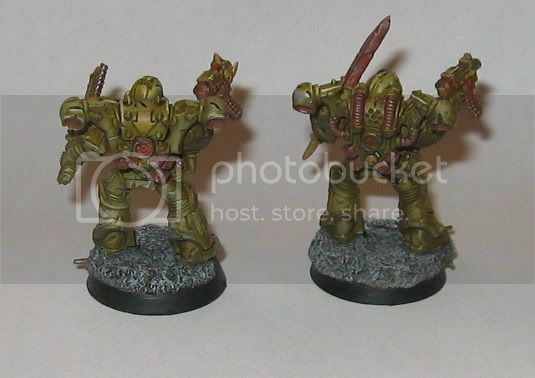 I painted two death guard test models to see how my intended color scheme worked. For most of the basics I used Les' airbrush tutorial at awesomepaintjob.com (Thanks Les!). 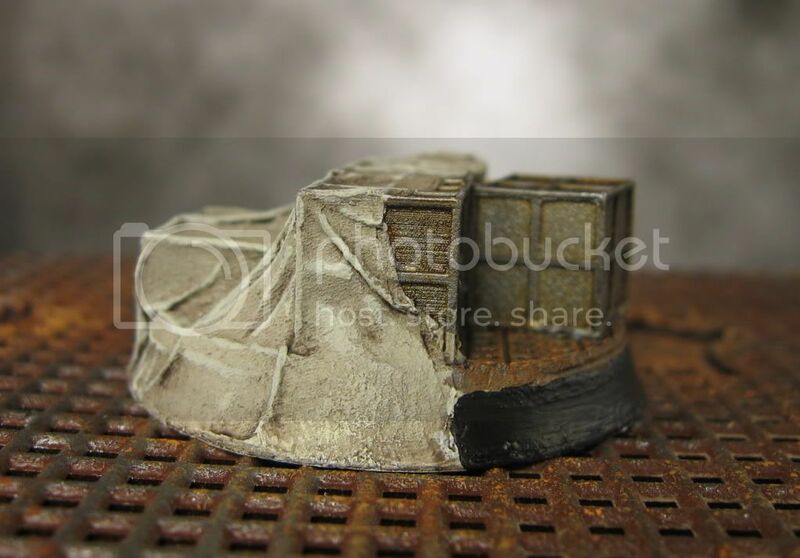 I used secret weapon weathering rust weathering powders to do the rust. I am not quite sure if I am happy with the rust. The ended up looking pretty red. I think it looks a bit unrealistic. Comments, tips, and criticisms appreciated! 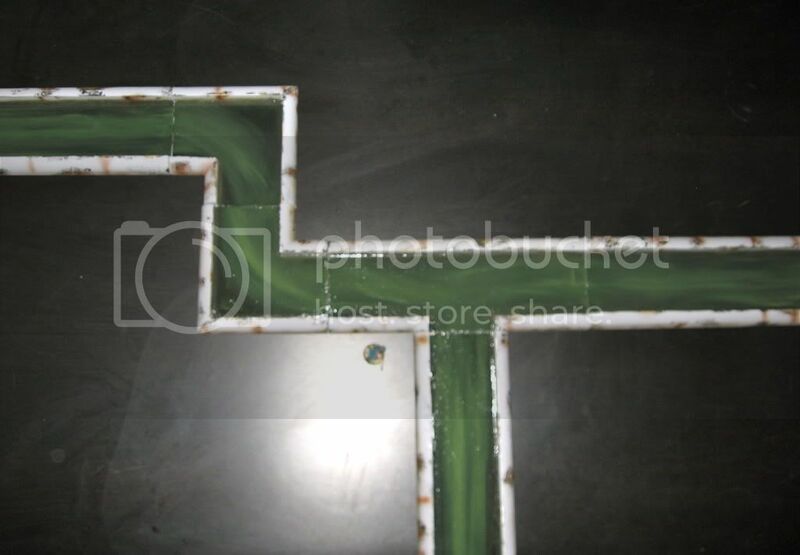 Airbrush only to this step. 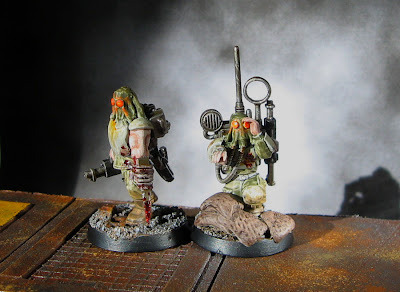 I also finished the conversions on two more renegades. I decided to try adding some hoods. Some worked better than others.